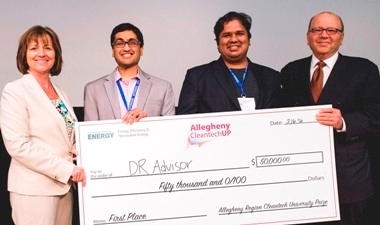 Waven Technologies, a team from Carnegie Mellon University placed second in the Allegheny Region CleanTech University Prize competition, held at CMU during its inaugural Energy Week celebration, March 14–18. This competition was one of eight regional contests in the U.S. Department of Energy’s (DOE) Cleantech University Prize (CUP). The CUP aims to inspire the next generation of clean energy entrepreneurs and innovators by providing them with competitive funding for business development, commercialization training and other educational opportunities. Waven Technologies tied for second place with Manta Biofuels from the University of Maryland. They were determined to have the greatest potential for moving into prototyping and customer testing of their products. Each team was awarded $15,000 from local companies supporting Pittsburgh’s new Energy Innovation Center. The top prize was awarded to the team that developed DR-Advisor, a response system that uses building data to optimize demand response curtailment.DR-Advisor is a tool that analyzes the electricity consumption in buildings. Using this analysis, it can make recommendations or choose a predetermined strategy to control energy use that takes pressure off the electrical grid and can save money in utility costs. The DR-Advisor team from the University of Pennsylvania received a $50,000 grant from the Department of Energy and a chance to compete at the national level against six other regional winners, June 21-23, in Denver. In 2015, the winning team at the national level was the CMU team Hyliion for its SMART suspension system for trucks. This is the first time that Carnegie Mellon has hosted a regional competition in energy. The remaining funds from a DOE grant to CMU will support CleanTech prize money for future competitions in 2017 and 2018. More information is at http://www.cleantechprize.org.